From time to time, I hear myself calling Marcello the Cat by another name — Ishkabibble. Usually it’s an unconscious substitution, but I caught myself at it the other day and had a vague recollection that I first heard that name from my mother and that she told me that it was the name of a character on a radio show. Since I can’t ask Mom about it any more and time is running out for me, I looked it up and found out that, indeed, there was a radio personality, Merwyn Bogue, who went by that nickname. Bogue was headed for a career in law but his comic bent and his skill with the cornet led him into the entertainment business. He was associated for many years with Kay Kyser’s orchestra — even while he served in the Army during World War II — and he appeared on Kyser’s radio and television show, Kay Kyser’s Kollege of Musical Knowledge. 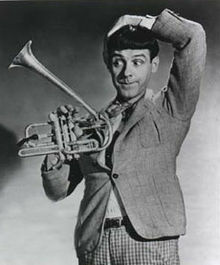 Bogue’s stage routine was laced with horn playing and nonsensical babble, but he was sharp enough in real life that he managed Kyser’s band from 1931 to 1951. 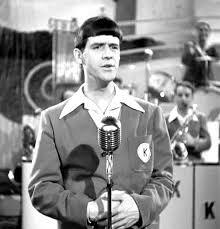 He also appeared in ten movies between 1939 and 1950. When the market for his brand of entertainment dried up, Bogue made a living in real estate. According to Bogue his stage name was taken from the title of a song — “Ische ka bibble” — ostensibly a Yiddish expression meaning “I should worry?” I have read in several sources, however, that the title is gibberish, not Yiddish. The song Bogue referred to was written in 1913 with music by George W. Meyer and words by Sam Lewis. This song apparently made the term almost immediately popular as a nonsense expression. Some folks who dabble in language think Ishkabibble could be derived from one of several actual Yiddish expressions, such as “Nish gefidlt,” meaning “It doesn’t matter to me.” There’s a three-minute video about Merwyn Bogue’s life at THIS LINK.